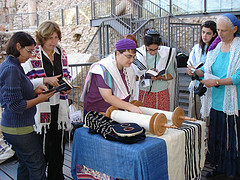 Women of the Wall reads Torah at the Western Wall, Rosh Hodesh Elul 5769. Photo by RahelSharon from Flickr. Creative Commons License. Welcome to the Jewish Studies Research guide! Click the tabs above to find research resources for your project or paper. Try the top databases on this page for a targeted search through the academic literature or the SuperSearch search box to search through all of Wellesley's holdings. Index to English-language articles, book reviews, and feature stories from more than 200 journals related to Jewish thought. 1988-present. Index to books and articles on all aspects of Jewish studies.